The 2015 Jeep® Cherokee debuts engine stop-start (ESS) technology, an emission-lowering and fuel-saving feature on 2015 Jeep Cherokee models powered by the 3.2-liter Pentastar V6 engine. The 2015 Jeep Cherokee powered by the 2.4-liter MultiAir2 engine is now a Partial Zero Emission Engine (PZEV) in the 14 states that have adopted California Air Resources Board (CARB) regulations. This entails a revised fuel tank, new fuel filler neck, new air cleaner, new engine downpipe, modified vapor purge canister and new fuel cap. The 2015 Jeep Cherokee delivers legendary Jeep 4×4 capability, a segment-exclusive nine-speed automatic transmission, fuel ratings of up to 31 miles per gallon (mpg) highway, superior on-road ride and handling, world-class craftsmanship, class-exclusive technology and more than 70 advanced safety and security features. The 2015 Jeep Cherokee provides a choice of three innovative 4×4 systems for best-in-class 4×4 capability in all weather conditions. The Jeep Cherokee is the first mid-size SUV to feature rear-axle disconnect, resulting in reduced energy loss when 4×4 capability isn’t needed – improving fuel efficiency. The rear-axle disconnect seamlessly switches between two- and four-wheel drive for full-time torque management and does not require input from the driver. Available on the Cherokee Sport, Latitude and Limited models, Jeep Active Drive I features a single power transfer unit (PTU), which is fully automatic and delivers seamless operation in and out of four-wheel drive at any speed. The system does not require any driver intervention or feedback, delivers yaw correction during dynamic events and improves both understeer and oversteer conditions. Available on the Cherokee Latitude and Limited models, Jeep Active Drive II includes a two-speed PTU with torque management and low range. The 4-Low mode locks the front and rear drive shafts for low-speed power or towing. Low range provides a 2.92:1 gear reduction. The gear reduction allows for enhanced climbing ability as well outstanding crawl ratios for severe off-road conditions. 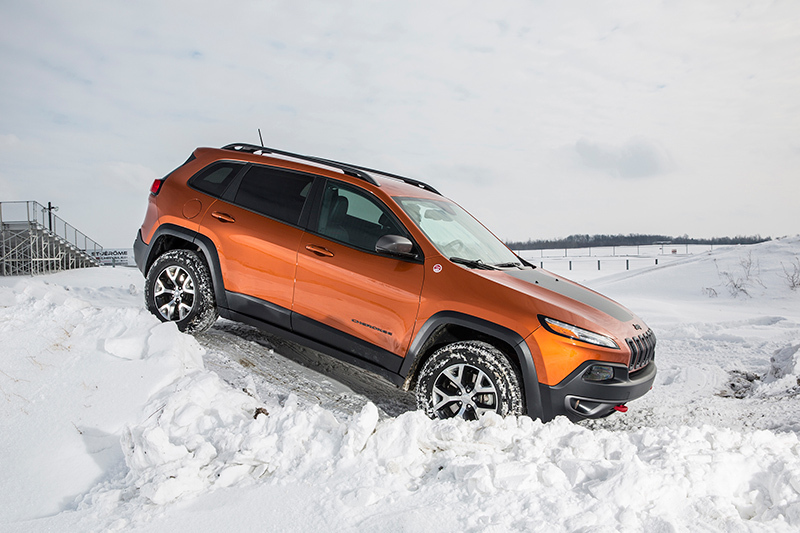 The 2015 Jeep Cherokee with Jeep Active Drive II gives the off-road adventurer a ride height that is increased by an inch, a crawl ratio of 56:1 when powered by the 2.4-liter MultiAir2 Tigershark I-4 engine, and 47.8:1 when powered by the new 3.2-liter Pentastar V-6 engine – up to a 90-percent improvement versus the outgoing model. All 4×4 systems feature the Jeep brand’s renowned Selec-Terrain traction control system, which allows the driver to choose the on- and off-road setting for optimum performance. Up to five customized settings are offered: Auto, Snow, Sport, Sand/Mud and Rock. Through the use of algorithms that enable unsurpassed control and capability, Selec-Terrain electronically coordinates and optimizes up to 12 systems on any terrain providing enhanced vehicle control including: drivetrain control module, electronic brake controller, electronic stability control (ESC), transmission controller, powertrain controller and Selec-Speed Control (Hill-ascent and Hill-descent Control). The 2015 Jeep Cherokee Trailhawk model exemplifies Jeep 4×4 capability with a distinctive, aggressive look, backed up by Jeep Trail Rated hardware, for the most capable Jeep Cherokee model and the most capable mid-size SUV in the segment. The Trailhawk includes, as standard equipment, aggressive approach and departure angles, complements of the unique front and rear fascias, one-inch factory lift, Jeep Active Drive Lock with locking rear differential, skid plates and signature red tow hooks. The locking rear differential is selectable in any low range terrain mode, but will lock automatically when in certain modes, such as “Rock,” to maximize tractive effort at the tire patch that can support it. 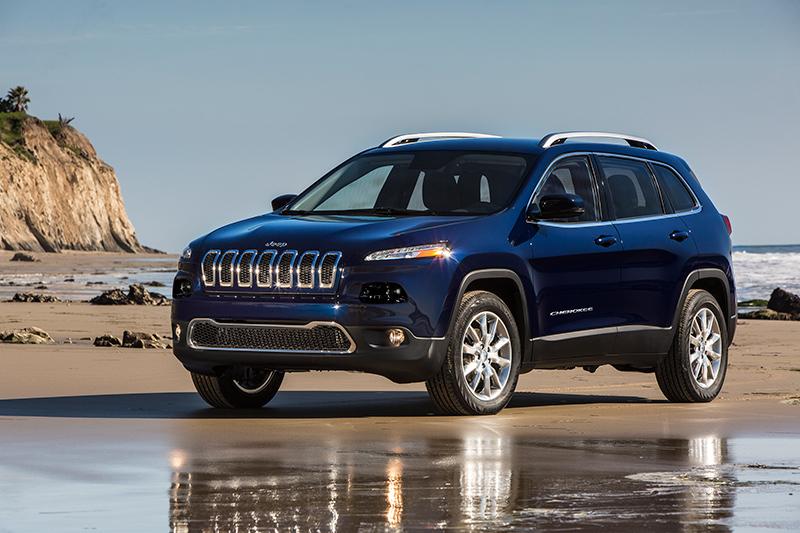 The 2015 Jeep Cherokee Trailhawk model with the standard off-road package is Trail Rated. The “Trail Rated” badge on the Jeep Cherokee Trailhawk indicates that the vehicle is designed to perform in a variety of challenging off-road conditions identified by five key consumer-oriented performance categories: traction, ground clearance, maneuverability, articulation and water fording. The 2015 Jeep Cherokee premium on-road manners and fuel efficiency are a result of a number of efforts by Jeep engineers. Powered by the choice of two new engines mated to a segment-first nine-speed automatic transmission, the all-new Cherokee delivers the power drivers appreciate on the road without sacrificing fuel efficiency. With highway fuel economy ratings of up to 31 mpg and a driving range on a tank of gasoline of nearly 500 miles, the all-new 2015 Jeep Cherokee delivers drivers a no-compromise ownership experience. The 2015 Jeep Cherokee boasts numbers that make the difference for the SUV customer that cares about fuel economy and capability in all weather conditions — fuel economy improvements of more than 45 percent, more than 70 safety and security features, numerous industry and segment “firsts,” a nine-speed automatic transmission, a 3.2-liter Pentastar V-6 engine with 271 horsepower and 239 lb.-ft. of torque, a 2.4-liter MultiAir2 Tigershark I-4 engine with 184 horsepower and 171 lb.-ft. of torque, nearly 500 miles driving range on a tank of gasoline and three new, innovative 4×4 systems that deliver legendary Jeep capability including crawl ratios of 56:1 with the 2.4-liter engine and 47.8:1 with the 3.2-liter engine, an improvement of up to 90 percent versus the outgoing model. The 2015 Jeep Cherokee competes in the mid-size SUV segment, the largest SUV segment in North America, with roughly 2 million sales in 2012. 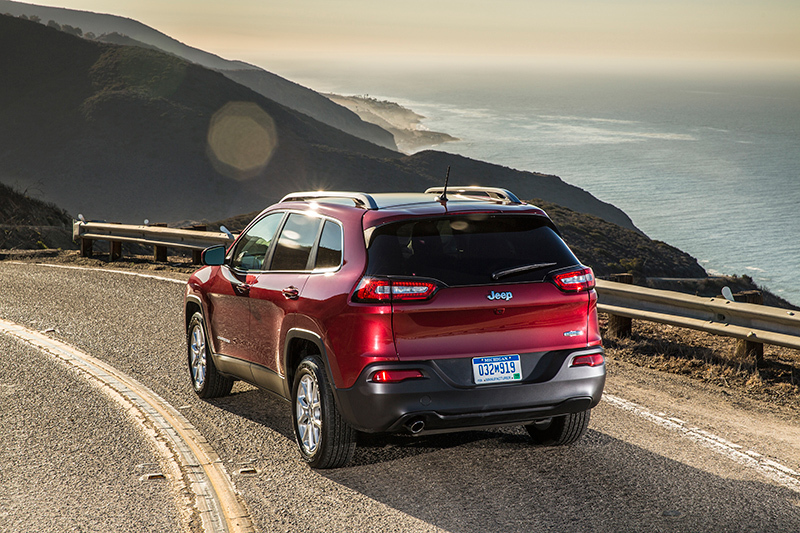 The all-new 2015 Jeep Cherokee is available in four different models in the United States and will arrive in dealer showrooms in the third quarter 2014. Customers can choose from the 2015 Jeep Cherokee Sport, Cherokee Latitude, Cherokee Limited and the rugged, Trail Rated Jeep Cherokee Trailhawk. The Jeep Cherokee mid-size SUV will offer consumers 10 different exterior colors from which to choose: Bright White Clear Coat, Brilliant Black Crystal Metallic Clear Coat, Billet Silver Metallic Clear Coat, Deep Cherry Red Crystal Pearl Coat, Eco Green Pearl Coat, Mango Tango Pearl Coat, Cashmere Pearl Coat, Granite Crystal Metallic Clear Coat, True Blue Pearl Coat, and Anvil Clear Coat.